Zoolander and Hansel are back. They were let lose to run around London after they came for the UK Premiere. It seemed they migrated to Abbey Road and spontaneously cloned themselves. 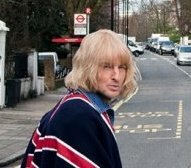 It’s not been badly put together in PhotoShop apart from “Hansel 1” who has something white growing out of the side of his head. I’m not sure what it could be. Some sort of brain control worm? Who knows!